GUMACA, Quezon – Former Special Assistant to the President (SAP) Christopher Lawrence “Bong” Go announced Thursday his proposed project to institutionalize one-stop-shop hubs in localities will be known as Malasakit Center. Go explained that the center would provide various services to constituents, as well as a convergence zone where concerned government agencies, such as the Department of Social Welfare and Development, PhilHealth, Philippine Gaming Corp., Philippine Charity Sweepstakes Office and Department of Health, could attend to the constituents’ needs, especially the poor. 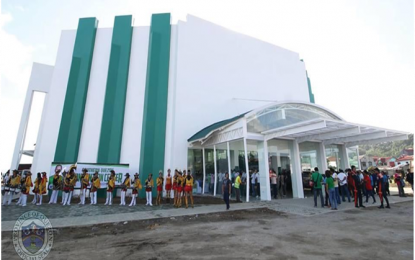 The former Presidential Management Staff (PMS) Secretary was in town Thursday to grace the blessing and inauguration of the cavernous Southern Quezon Convention Center in this 4th district and southern Quezon town. “This facility is a testimony to the hard work and strong commitment to furthering the goals of the government. Convention centers generate income and tax revenue. They attract visitors, tourists and investments, which translates to new and greater opportunities for the community,” Go remarked. He was welcomed by Quezon Governor David C. Suarez, House of Representatives Minority Floor Leader Congressman Danilo Suarez, ALONA Party-list Rep. Anna V. Suarez, and Gumaca Mayor Erwin Caralian to a rousing welcome from hordes of townsfolk and officials at the jampacked convention center. Go said the establishment of the Southern Quezon Convention Center shows the competence of provincial and local governments and the excellent public service of the officials, serving as a gathering center for a united people and a one-stop-shop hub that could spur economic dynamism. “Ang Convention Center na ito ay dahil sa lahat ng mga naniwala at nagtiwala na mayroong mas magandang bukas para sa atin. Ito ay para sa mga mamamayan ng Lalawigan ng Quezon (This convention center was constructed because of all those who believe and trust there is a brighter future for all of us. This is for the constituents of Quezon province),” Governor Suarez said. He assured that the fourth district of Quezon would be provided with more opportunities for development through the Southern Quezon Convention Center.